Making a strawberry facial mask is easy and has many beauty benefits for your skin. Probably everyone knows of the great nutritional benefits strawberries have, but most people do not know, that this fruit also offers plenty beauty benefits. Strawberries contain salicylic acid that rids the skin of dead cells, makes your skin pores smaller and your face look brighter and shinier. They gently refresh and exfoliate the skin, remove impurities, and reduce redness and swelling, which is wonderful for a cleansing and skin softening facial mask. In addition, the antioxidants in the fruit help to repair skin damage and counteract aging effects. Your skin produces millions of new cells every day, and regenerates itself completely every 30 to 40 days. But after the age of 30, this natural rejuvenating process slows considerably. At this time, the skin can benefit from a strawberry facial mask. 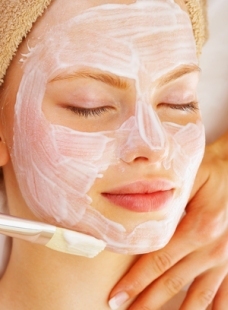 Apply the mask by beginning at the chin area and moving up to the cheeks and forehead. Apply the nose next, moving outward toward the cheeks. Be sure to leave space around the mouth, eyes, and eyebrows. Finally, spread the mask on your throat, moving from bottom to top. Always use it immediately! Because you don't use preservatives, the mixture can go bad and damage your skin! Rinse the strawberries and dry with a clean cloth or paper towel. In a small bowl, mash fruit with a fork. Add cream and honey, mixing well. Apply immediately and leave on for 20 minutes. Rinse of with lots of warm water. Mash together all the ingredients to make a smooth paste. Spread over your face and neck and let sit for 20 minutes. Rinse with warm water and pat your skin dry. Can't make your own? Buy it! Sometimes you can't make your own face masks, for several reasons. Maybe you're short on time, or it's just not berry season where you live, and you can't get your fingers on red, ripe strawberries, or you're just too lazy to do the mixing. Whatever the reason, buying a strawberry face mask is perfectly all right!